I'm a fan of the Netflix series Travelers, a show about time traveler teams from the future coming back to our time by inhabiting the bodies and lives of people who were on the brink of an unnatural death (accident victims etc.). The premise being these teams are on a mission to change an apocalyptic future. It's a great show, well worth your time. One feature of the show is nanite technology, which is used to medically repair the body by injecting 'nanites' into the bloodstream of the patient. The result is a more rapid recovery with nanites seemingly able to repair all kinds of medical conditions from brain injuries, diseases, to gunshot wounds. Recently, Cold Fusion, a technology, thought, and ideas, based Youtube channel released a video called Cancer Killing Nanobots (New Research), which I've embeded below. As you'll see it covers much of the latest medical breakthroughs in relation to Nanobots to the point where they've even seen success with reducing cancer cells in mice. The parallels to the nanite tech used by the Travelers is obvious. It's certainly an exciting time to think nanite technology isn't entirely a fictional idea of a show like Travelers. Nanobots clearly are the first steps towards a robotic technology that can potentially be used to fight all kinds of conditions via the bloodstream. Naturally my only concern is what if someone decides to attach lasers to nanobots? 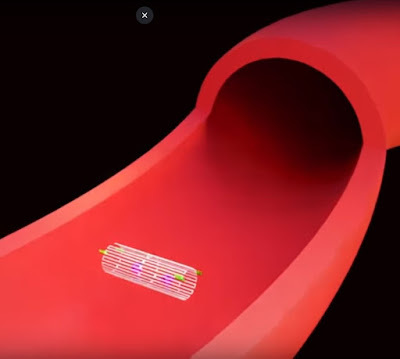 Tiny robots in your bloodstream running around with tiny little laser guns, just waiting for your robot vacuum cleaner to signal the robot uprising... well, maybe not but it pays to be vigilant!